I’ve already mentioned that 19th Century Russia was a fertile breeding ground for Decadence, and this wonderfully strange book proves my point. What adds to the strangeness is that The Fiery Angel is partly autobiographical, but more on that in a minute. 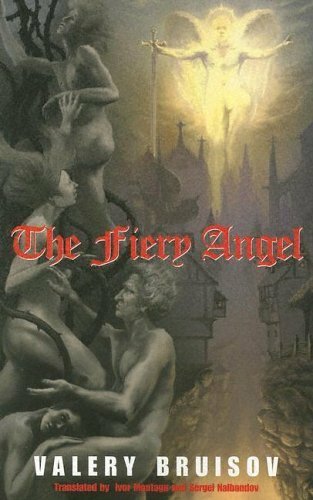 Set in Medieval Germany, an age of religious fanaticism and the Inquisittion, The Fiery Angel tells the story of a young knight, Rupprecht, who when returning home meets a young woman called Renata who is prone to visions and claims to be searching for her angelic beloved, Madael. The pair travel together, and enter into a sado-masochistic relationship, delving deeper and deeper into occult practices. The description of the Black Mass Rupprecht attends is an excellent demonstration of the author’s profound knowledge of the supernatural. Rupprecht is obsessed with Renata, who treats him in turns with cruelty and affection. Cameo appearances are made by Doctor Faustus and Mephistopheles, and Doctor Agrippa. What is truly remarkable about the novel is that Bruisov never gives any clear solutions to the things that happen. Is Madael an angel or a demon? Is Renata really in contact with the spiritual world, or is it hysteria? Can the paranormal events be explained away by science? It is a powerful and compelling novel, dealing with key Decadent issues such as Satanism, femme fatales and sexual hysteria. Bruisov himself was a somewhat contradictory character. While he had undoubted genius, many of his Russian contemporaries doubted if his heart was in the movement – he was naturally repulsed by the concept of ennui, and it was often said that his ambition drove him towards Decadence because he saw that it was the Next Big Thing. Nevertheless, his knowledge of the occult was profound, and he influenced more that one of his acquaintances to commit suicide. I mentioned before that The Fiery Angel was partly based on events in the author’s own life. Andrei Bely, a fellow Decadent posessing almost angelic beauty, became a close friend of Bruisov’s. Friendship turned to rivalry – both literary and, some said, magical. The relationship also led Bruisov to meet Bely’s spurned mistress, the nineteen-year-old Nina Petrovskaya. Together they attempted to win back Bely’s love for Nina through magic, before dropping the pretence and embarking on an intense seven year affair. After their passion died, Nina fled to Paris where, in the manner of so many of Bruisov’s companions, she would later commit suicide. All the evidence would indicate that Rupprecht was a representation of Bruisov himself, Madael the angel was inspired by Bely, and Renata was a representation of the tragic Nina. Hi, this sounds really interesting and psychologically fascinating, I’ve personally always loved Marlowe’s Dr Faustus and Goethe’s poem so the fact that Faust makes a cameo sells it to me, that and the general weirdness, femme fatales and sado-masochism lol. Yeah, he was a very strange guy by all accounts. I actually have the soundtrack to Prokofiev’s opera – it’s really good and I’d love to see it performed. It’s the kind of story that lends well to drama.